This is a Used Samsung Galaxy Gear R800 smart Watch Stainless Steel Case With Black Sport. improved battery life and functionality. Battery life was a real issue with my S2. Right now I'm getting about 4 days. That's a great improvement. There were some days when I had to charge the s2 twice. The sleep function, heart rate and step counting are very much improved. Notifications are about the same as the s2. I simply love it, I thought it would look big on my small wrist but it fits awesome. Battery lasts about 4 days if set up properly (you can search on YouTube). 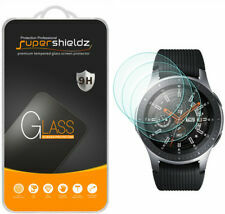 Phenomenal smart watch, great battery life and functionality looks good too!